Unusual Baby Shower Gifts: Mothership Shoe Captured Wish! Unusual Baby Shower Gifts: Mothership Shoe! Unusual baby shower gifts are very tricky to find. You always have the nagging feeling that they might not be appreciated -- or that somebody else will have had the same idea, duplicating your effort. That's impossible with Captured Wishes. Every gift is unique and special and captures the words or feelings you may need a little help in expressing. Get ready to give the best "welcome to Motherhood!" gift today in this complete package. So personal and appropriate yet so convenient for you. All included: the present, the card, the gift box. All that's needed is your love and signature. Give to the expectant Mom-to-be who LOVES keepsakes! This wish vessel was purposely created to celebrate the arrival of motherhood; the birth of a baby, a new family member, be it a boy or a girl. 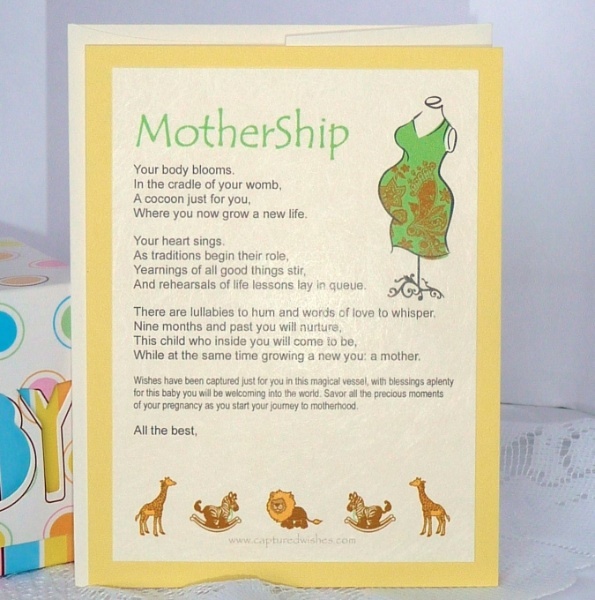 The verse card stirs up quite the array of emotions that every newly expectant mother may go through. A gift to cherish for the "first timer" or for the couple who are finally expecting. This beautiful Captured Wish (height approx 30mm x 15mm width) is a charming and unique way to bring some joy to the mother-to-be. Filled with lucky fairy dust and decorated with funny and touching charms, each Wish Vessel is unique and one of a kind, just like the Mom! Discover more Chic and Unique Baby Shower Gift Ideas!